New Hatchboards — O'Day Mariner #1922 "Orion"
One of the things I like so much about the older style 2+2's is the wood detailing. You just can't beat those mahogany coaming tops. All the exterior wood (coamings, hatchslides and hatchboards) needed to be refinished, and in the case of the hatchboards, I needed to make brand new ones as they were in really rough shape. All the mahogany had weathered grey, and although there are some who actually prefer that appearance, I prefer to see the grain underneath layers of varnish. When I bought the sheet of mahogany plywood for the cabin sole, I made sure there was plenty left over for new hatchboards. Cutting new ones was actually quite easy - I simply clamped the old boards over the new plywood and used a flush-trim router bit to copy the exact profile. A little sanding after that, and I was done cutting all three in less than a half hour. The bottoms and tops of adjoining hatchboards were then recessed about a half-inch so they would shed any rainwater. I simply ran the board edges over the table router to achieve that. When the new hatchboards were sanded, I tackled the coamings and hatchslides - that was the fun part. Using a random-orbital sander, I sanded away that grey wood until bare, clean wood appeared. What beautiful mahogany! I certainly wanted to lay on plenty of coats of Epifanes High Gloss varnish, but I first started by coating everything with West System 105/207 - the 207 hardener is specifically designed to be used as a varnish undercoating. The process is explained in detail here - "Varnish Over Epoxy". This, unfortunately, ended up being a mistake. After two and a half years since I refinished the coaming tops and made the new hatchboards, I found that any small nick in the wood or a crack that had not been totally sealed allowed water to get underneath the epoxy layer, lifting it up and compromising that and the varnish. The coaming tops looked bad, and the hatchboards were in pretty rough shape. I actually ended up removing everything from the coaming tops last year and started completely over with eight coats of just Epifanes varnish, and what a difference after a full season! Someone once told me, "You shouldn't glue with paint, and you shouldn't paint with glue." I suppose I should have listened! So, in short, I do not recommend using an epoxy undercoat. Stick with many layers of varnish, and you can't go wrong. As I grew up at my family's marina, I learned a lot about varnishing at a fairly early age. I owned my first boat - a Dyer Dhow which I still own - when I was 10 years old, and the spars, thwarts, rubrail and oars all required yearly varnishing maintenance. I was taught how to do it and, 20 years later, I still enjoy varnishing very much. I even look forward to the varnish maintenance that comes with the Dyer and, now, my Mariner! I have also had a great deal of experience with various types and brands of varnish. Two-part varnishes (urethane base + catalyst) are usually very smelly and extremely difficult to maintain, as any repair - no matter how small - requires a careful mix of the two parts, something that usually ends up with a lot of wasted expensive varnish. One-part varnishes are most certainly the way to go. So, that narrows the field slightly, but then there is the question of "rapid coat" varnishes versus the "regular" clear, high-gloss varnishes. 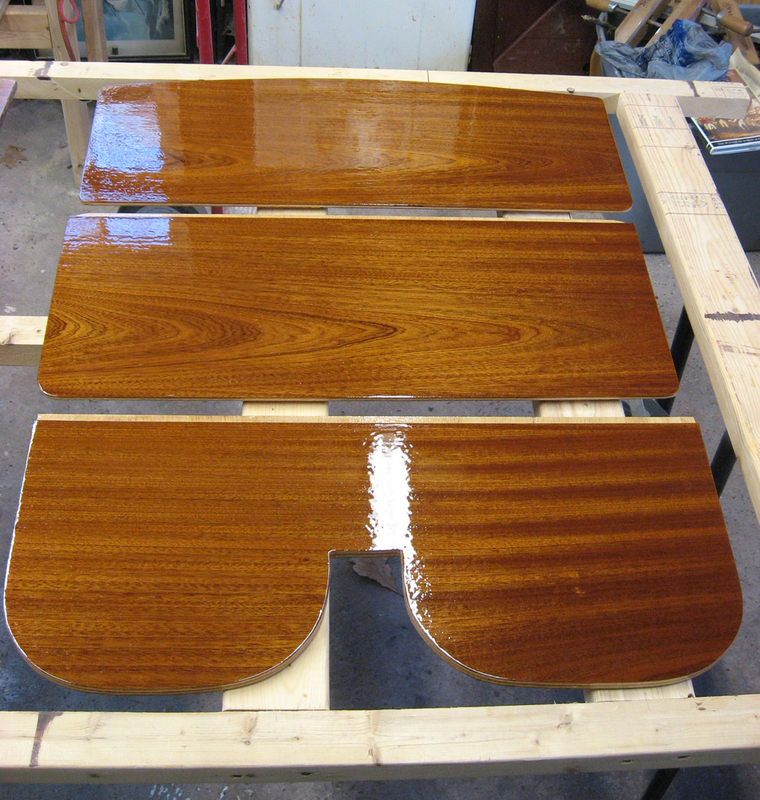 Rapid Coat varnishes are designed so one may apply several coats of varnish a day without sanding. I have not had good luck with Rapid Coat varnishes as they are usually extremely thin; runs, sags and thin spots on edges are inevitable and frustrating. Most brands of varnish are fairly decent. In the interest of saving space in this article, I'll just cut to the chase - I always come back to Epifanes Clear Varnish. It is very durable, long-lasting, and you can't beat it when it comes to looks. It is applied the "regular" way (I won't call it "old-fashioned", because it's not), meaning it should be dry before applying another coat. This may take at least an overnight, although colder temperatures or humidity may increase the drying time. And, speaking of temperature and humidity, the lower the humidity, the better. Working in the shade is best with an air temperature around 72 degrees, but I've applied varnish anywhere between 50-90 degrees - you work with what you have, right? Don't varnish if it's raining or about to rain - it will take a long time to dry. The first coat should be thinned 50% so it can sink into the wood and really "grip" it. When dry, sand lightly with 220 grit sandpaper. The second coat should be thinned only 25%. Again, lightly sand when dry. The third coat should be thinned only 10%, and after that, brush it on unthinned to start building up the actual thickness. I like to put eight coats of varnish on everything when it starts out as raw wood and just two maintenance coats on stuff already in good condition during the winter. While some use tack cloths to get every bit of dust off the wood after sanding between each coat, I'm generally not so picky - a good shop brush will get rid of most of the heavy stuff. But when I do feel like being picky, a quick swipe with a rag moistened with mineral spirits will get the fine particles off - just make sure it's completely drybefore you start varnishing. Also, a 2" foam brush works very well. You can buy special brushes for varnishing (I have several), but they require some maintenance. Foam brushes are a fine alternative if you don't want to be bothered cleaning all the time. When you find a piece of wood with the varnish in bad condition, sometimes it's best to strip off all the varnish and start over from scratch. While some chemical strippers work well, most are toxic and not good for the environment. Other "green" strippers only work fairly well but are still expensive and messy. The best thing to do is use a heat gun (or a very hot hair dryer). Heat up a small section at a time, perhaps about 6" or so. Only heat it up until the varnish softens - do not scorch the wood underneath! This may take a little practice. Then, using a regular scraper, scrape off the softened varnish before it gets cool. Then move on to the next section. It goes quite quickly. Finally, you can keep a "touch-up" varnish jar on board, ready to go in case of a scratch - just use a well-cleaned-out nail polish jar with the brush attached to the cap, and carefully fill it with varnish. Keep a small square of 220-grit sandpaper rubber-banded to the side of the jar so you can use it to sand the scratch before applying the varnish. It's very handy! Good luck with your varnishing projects!